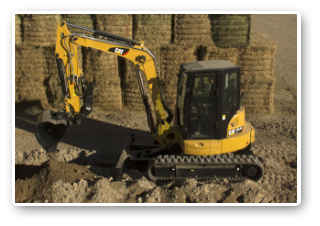 Within the last year, the industry has seen almost 20 percent growth in the use of mini excavators on farms. This trend can be attributed to the sheer versatility of the machine. With a mini excavator, farmers and ranchers are able to execute multiple tasks with one machine versus renting or purchasing multiple machines. Whether you are managing a dairy farm, row crop operation or cattle ranch, there is plenty of work to do outside of production. Mini excavators are proving to be especially helpful in maintenance-type tasks that need to be completed in order to keep agriculture operations running as effieciently as possible. READ THE FULL BLOG and learn about the tasks mini excavators are tackling on the farm. For machines specs, special offers and customer testimonials, VISIT THE CAT® RESOURCE CENTER.